I've no desire to hear this album (though I'm surprised by how many of the songs on it I know well) but have always thought the title memorable, indeed, almost iconic. And now to find that if followed Sgt Pepper at the top of the charts... well, them was the 60's! 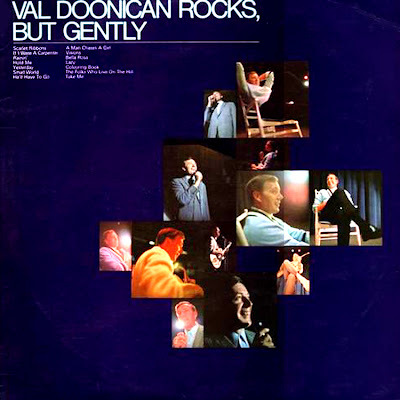 There's something impressively grown-up about Doonican's voice, I think, despite his pipe and slippers image leading you to expect a treatment of emotions that's infantile and false. The best moment for me is the phrasing of "emptiness and pain" in 'What Would I Be?'. You don't doubt that the singer knows them, and admire his strength in managing to overcome them. Thanks for this item. My mother had this LP and I’ve always been fond of it. I think it has the wittiest title ever given to an album. The line from Bella Rosa doesn’t go “It’s Saturday night…it’s bare and it’s cold” It should be “cold and it’s bare” to rhyme with “I lie in my bed and just longingly stare”. Ahhh Val understood!